On Saturday, she went off by herself and looked pensive. 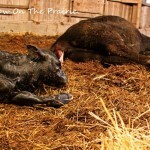 This and the fact that her udder had filled up told us she was close to calving. 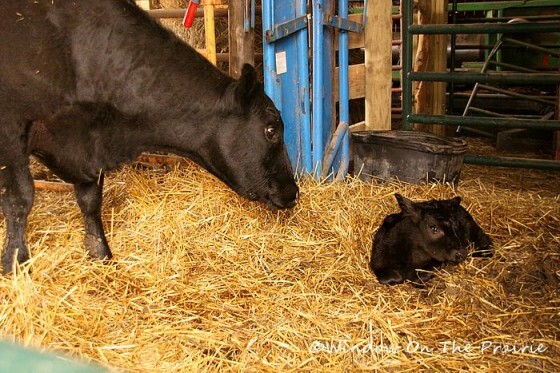 When Harland checked on her early Sunday morning, she was in labor, so Harland put her into the barn out of the rain, and left her alone as cows get nervous when we watch them while calving. An hour later he checked on her again, and she had pushed a little hoof out. 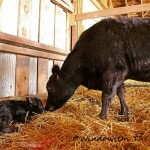 After another hour, she had pushed the rest of the calf out. 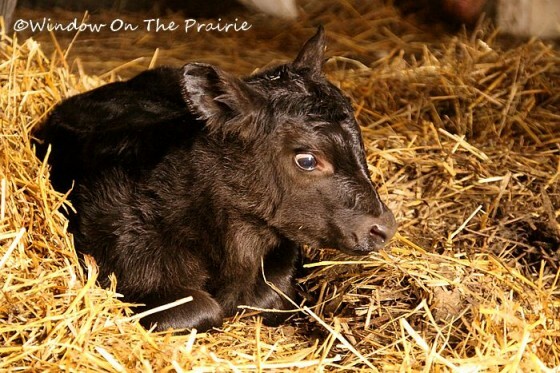 But it wasn’t until the afternoon that I had a chance to go up to the barn and take a look at the new little squirt. 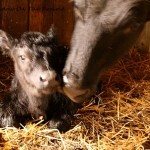 Later, I shooed the unruly mob out of the barn and was able to get a few pics of Cleo and her baby. 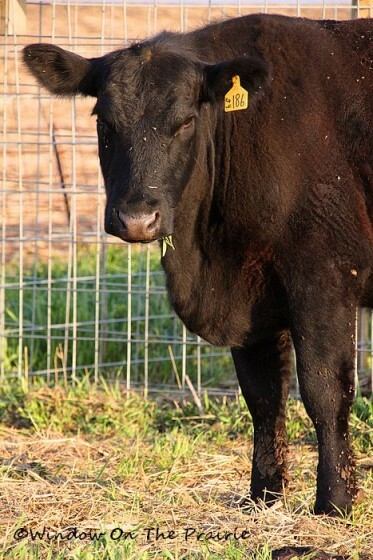 And yesterday, Harland let her out into the pasture to enjoy the sunshine and green grass. After taking pictures of her baby, I asked Cleo if birth was as “painful and difficult” as she was hoping it would be. So that leaves 4 heifers left to go in the Maternity Ward. -From left to right: Babs, Margaret, Snub-Ears, and Nellie. Babs, according to Harland, is “no more pregant than I am”. 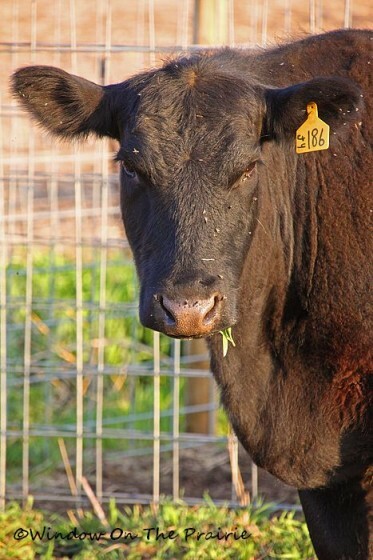 When they were preg-checked back in November, the vet said she had a calf in her, but something must have happened since then because she shows no signs of being being pregnant now. So we have 3 more to go. Stay tuned. You came to the party with no grain??? What kind of host are you? Congrats to Cleo for a healthy delivery! p.s. I have no grain either! They get grain twice a day, but for some reason they think they should get it more often. Hooligans. How cute is he! I loved it but got pretty nervous when all the girls started closing in. They kinda scared me! Land as far as I could see…do you have any close neighbors???? How far are you from a town? Nearest neighbor is about a mile away. We’re about 3 miles from the nearest town, but all it has is a post office, grain elevator, collision repair place, and 2 very popular vending machines. 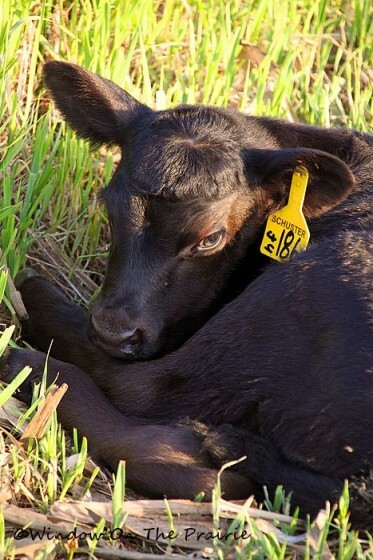 Cute calf, Cleo, good work. Love those wide eyes !~! Amy asked a couple of questions which I have thought about too over the years I have read Suzanne’s blog: how far is it to a neighbor’s place? Town? Costco? Target? Farm supply store/hardware/lumber outlet? Medical help? Nearest neighbor is 1 mile. 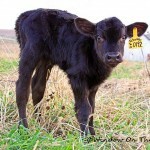 Nearest town with gas station, walmart, grocery store, farm store is about 12 miles. Nearest Target is 70 miles. Nearest community hospital is 7 miles. 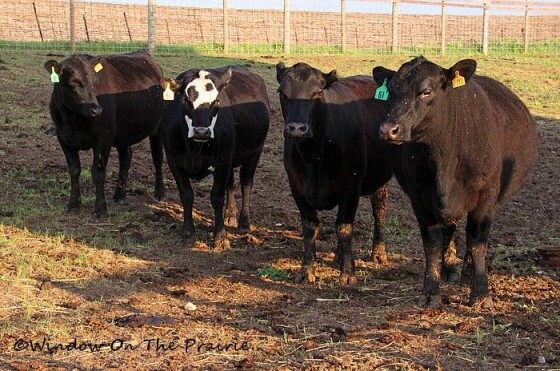 Your family’s land in OK sounds very like ours: mostly gently rolling hills with tree lined streams. In places you can see 20 miles or more. 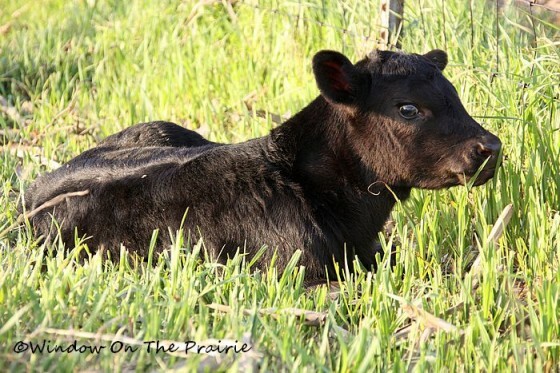 That is one cute little calf! Mama must be so proud! Love your ‘conversations’! Thanks Karen. It’s especially pretty this time of year with everything green and new. Congrats to Cleo…she has a beautiful baby. When I saw the pics of the new baby, it reminded me of a newborn baby deer for some reason, just the way she looked so shy and sweet…………so I’m just gonna throw this name out there…….BAMBI. She looks like a Bambi! Anyway, she’s beautiful and momma should be proud. Bambi it is. Thanks Louise. 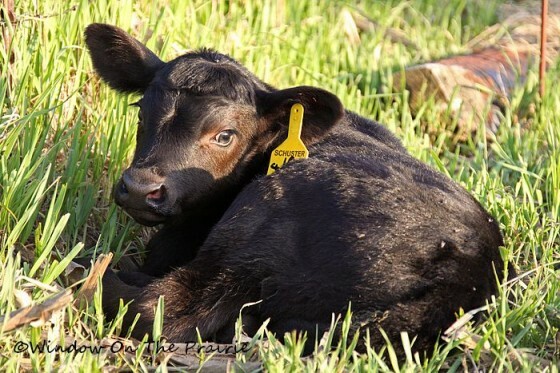 It’s a wonder the cows don’t put in requests for different color tags so they can make a fashion statement. 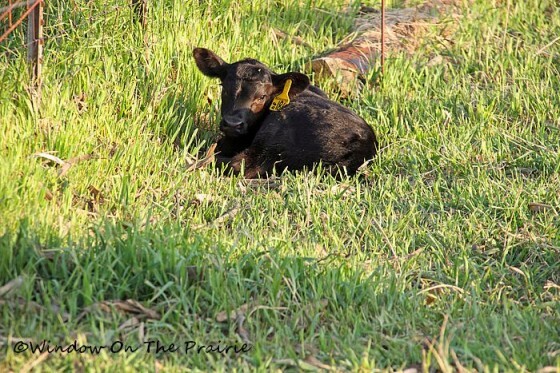 What a cute calf — you are such a good photographer/videographer of all the cow/calf goings on! Thanks, again!